Note that many of the US Highway designations are not the original ones that we all know of. US 75 north of Dallas is shown as "US 73"
US 75 south of Dallas is shown as "US 77"
SH 289 shown as "SH 115". 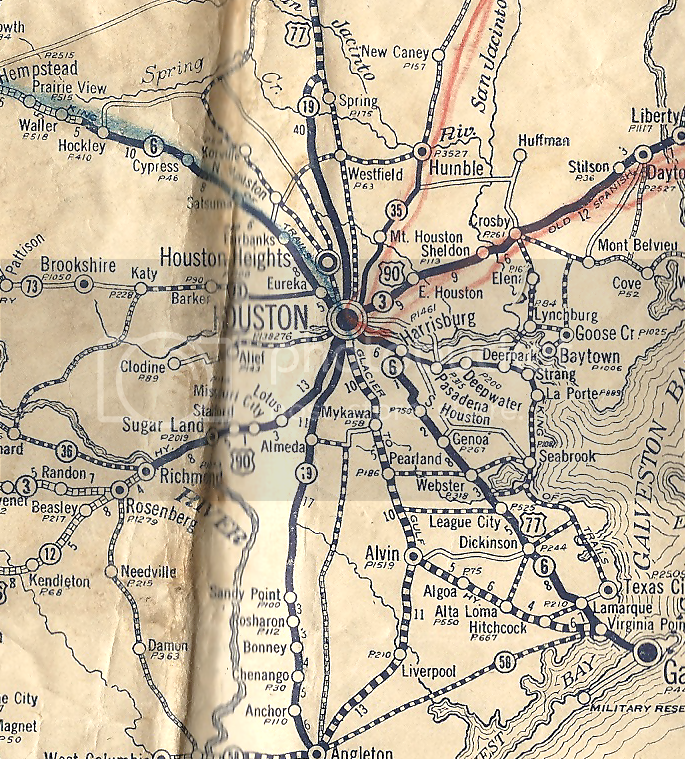 The other maps say it was "SH 116" during this time. Also note the old alignment of the highway (to become 75) between Ennis and Corsicana. Look at the old highway north of Emhouse on Google Streetview.http://maps.google.com/maps?hl=en&ll=32.165886,-96.57724&spn=0.000145,0.10025&t=m&z=14&layer=c&cbll=32.165886,-96.57724&panoid=TOGFVXcZHJ5GLCJKlVK3fw&cbp=12,182.9,,0,0 It appears to be an old concrete hwy, but one side has been converted to gravel. Odd. This map shows two "main roads" between Azle & Ft Worth. Krum is shown to be on TX 39, which doen't make sense based on my local knowledge. Note that the former US 370 (now US 287) corridor is shown to be "US 385". This is the first I've ever heard of this. I doubt if it was ever signed. And since there is only one source, I would need to see other evidence that this was ever signed. My 1928 Rand McNally shows US 75 in the expected places both north and south of Dallas and down to Houston. Also, it's the expected US 370 at Wichita Falls. The embedded population numbers on the 1927 map are a nice touch, though. The RMcN doesn't have those, not even in the index. Who published this map? RMcN? Or another company? This is simply the preliminary 1925 plan with a few of the 1926 changes applied (such as 85 to 385 and 60 to 66). As a cartographer, I can tell you that we make up stuff educated guesses a lot more often than you'd think. Considering what I've seen on maps, I definitely believe you. As a cartographer, it would be difficult to make accurate maps of areas that you are not personally familiar with. This is why map companies neew to hire "knowledgable persons" in each area to review their maps, and point out any errors to them. Often its things like "where is this fire station? oh, about here I guess" - but most mapmakers ignore route designations a lot more than you'd think. 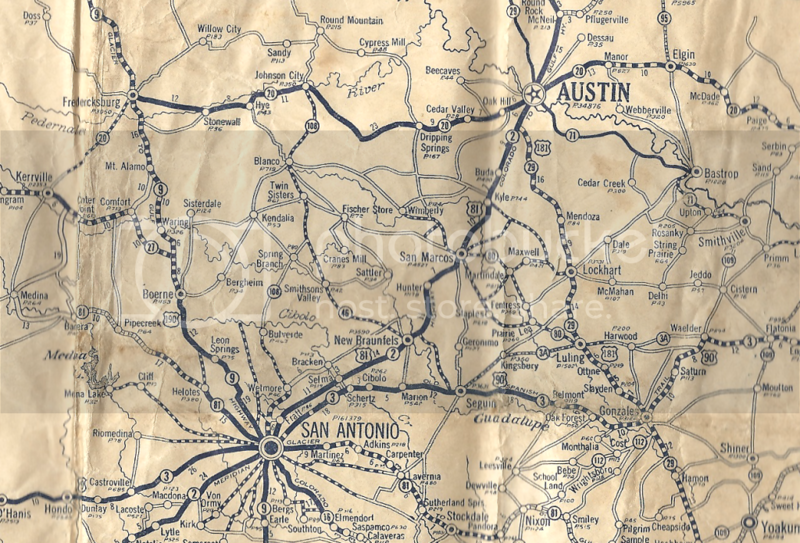 At Mapsco we had US 81 in San Antonio until 2009 until someone (me) noticed. Justin, how do map makers keep up with changes? What are their information channels/sources? Generally for street we'd use plats, but unplatted streets (like FM 2499 extension or Lewisville Lake Toll bridge, etc) we just have to know about. At Rand McNally we outsourced data collection, at Mapsco we just got a lot of newspapers and drove around a lot. You have to call cities for city limit changes and ISDs for new schools. As for the incorrect US Highway numbers they probably just had a source and without anything better they copied that source. Thats a cool map, btw. Crazy thing looking at that map is about dozen towns list around Houston are completely gone. All that is left is a street name. 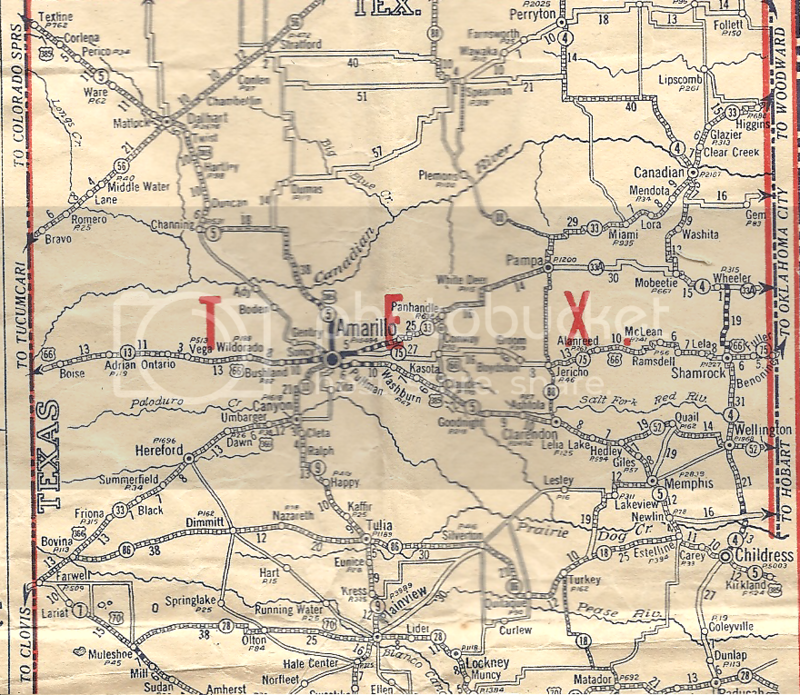 Oklahoma Department of Highways maps show US 73 in Oklahoma as late as February 1934 (the first one with US 69 instead of 73 was the October 1935 edition). It wouldn't make any sense to leave it on the maps that long and sign it as 69, especially in the crucial first years of the US route system when everyone was still getting the hang of the new numbers. It seems reasonable to me to assume that US 73 was in fact signed for that eight year period. 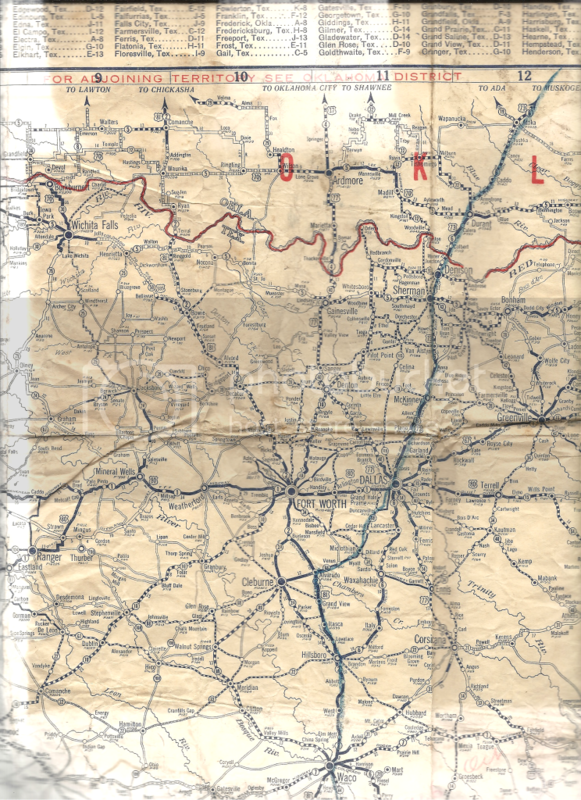 Presumably in 1934 it was determined that it made more sense for US 69 to continue south of Kansas City, since the route south of there was more fitting in with US 69's path north of KC. And thus US 73 was truncated. Wikipedia's article on US 73 is in need of attention (no regular editors in Kansas or Nebraska) so it doesn't have the full story. It doesn't mention US 73 entering Texas at all; apparently at one time it ended in Atoka, and this is what Wikipedia notes. I didn't say that US 73 was never signed in Oklahoma, I said that it's likely it was never signed in Texas. I have seen an Oklahoma US 73 shield. somewhere I have a photo. It is a style which was used as early as 1928. I was thinking earlier that I'd like an Oklahoma US 73 shield. It may be a future purchase for me. not sure who has it. I recall it's nicer than your Arkansas US 59, but not by much. btw, I just sold an original-paint Arkansas US 65, fully embossed in about 7/10 condition, for 1150. so that gives you a data point for how much that 59 is worth.